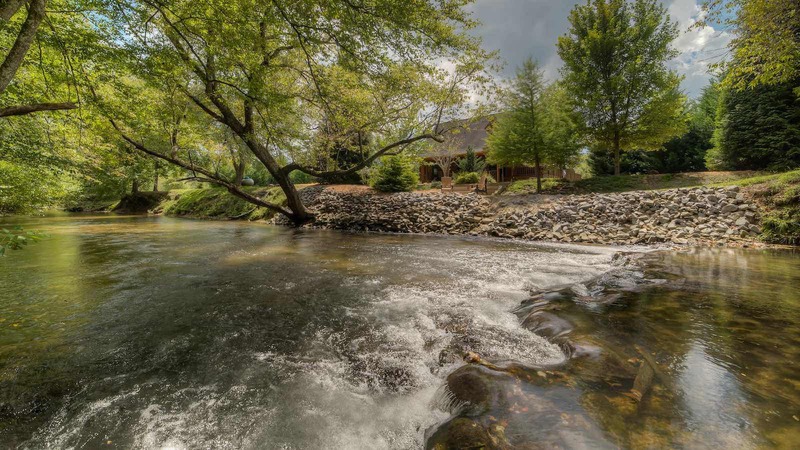 Stone Creek Lodge is a beautiful creekfront cabin perfect for water lovers looking to vacation in Blue Ridge, Georgia! This cozy pet friendly cabin overlooks Fightingtown Creek with plenty of opportunities to relax while listening to soothing sounds of the water as well as chilling at the outdoor stone fire pit, playing a friendly game of horseshoes, or hosting meals in the ample deck space! Upon arrival, you'll notice the two-car garage that is available for guests use (a rare commodity in vacation rentals!) and the beautifully planted trees and shrubs surrounding the cabins grounds. 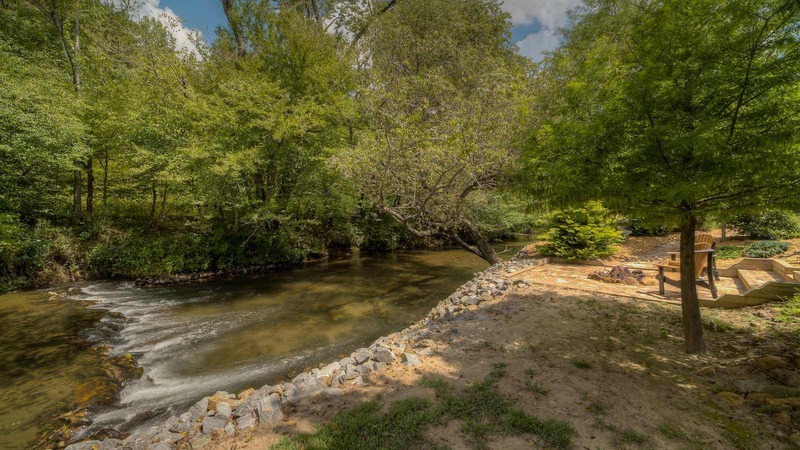 The area is relatively gentle, with a stretch of grass designated for horseshoes near the creek and lots of yard for your fur babies to chase a ball! The cabin has a large wrap around deck, with the portion facing the creek being covered. This wrap around deck has lots of porch furniture for relaxing while taking in the mountain air. The all-stone fire pit is between the cabin and the creek, where you can tell stories by the glow of the fire and roast marshmallows. The covered deck overlooking the creek has seating and an outdoor dining table. The outdoor dining table is just waiting to host brunch, wine and tapas, or a dinner party to remember! 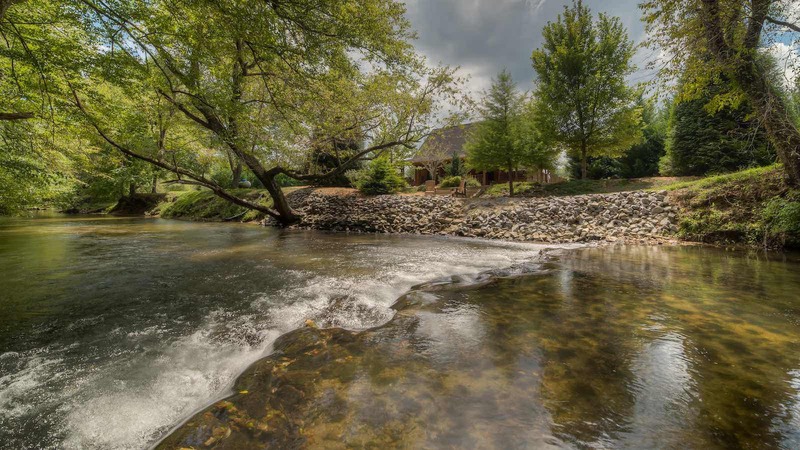 The hot tub is on the open deck portion, facing the creek and ideal for stargazing while soaking stress away watching the waters of Fightingtown Creek roll by. Inside the main level, you'll have a cozy living room with a stone gas log fireplace and TV. This area flows into the dining space which has a farmhouse-style dining table and pub table. The roomy kitchen is just off the dining space with plenty of counter prep space and stainless-steel appliances. Just around the corner is the main level bedroom and bathroom. This bedroom has King bed, TV and a private bath with a single vanity and glass door standard tub shower. The upper level has a cozy nook with a desk, great for catching up on some online shopping, journaling, or squeezing in some work while on vacation. This open off has two twin size beds as well. A few steps away, you'll find the two upper bedrooms and bathroom. The bathroom on this level has a single vanity and glass door tub and shower. Each bedroom has a Queen bed and TV. 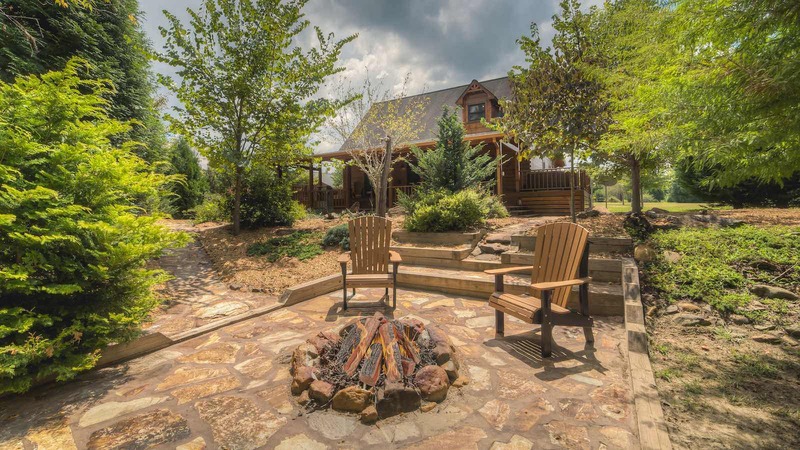 Stone Creek Lodge is the relaxing retreat you've been searching for, with the array of outdoor living space and amenities plus the cozy interior's offerings. Getaway to Stone Creek Lodge and recharge!